BGC Masters Day 5: The World Champion John Higgins and World Finalist Judd Trump stormed into semi-finals after their wins today. 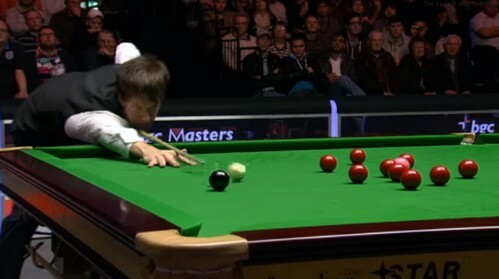 First one through was Judd Trump, who beaten Ronnie O'Sullivan by 6-2. The two players clashed on twice this season before this quarter-finals that Trump won them all on deciders. The match today was the big one to watch but it did not go that tight this time. The Rocket got a decent chance to win the first frame but missing the pot of easy black to drop the frame. From then on, the Bristol 22-year-old was in a fluent flow - a 66 to put him 2-0 up and came from 0-49 behind to take the third frame with 78. Trump took the last frame before mid interval with a total clearance of 140, the highest break of the tournament so far. The Rocket has not yet scored a frame and he broke the ice in the fifth frame. He won his first frame in the match with a break of 67 but the 'naughty snooker player' won the scrappy sixth frame to go 5-1 up. Nevertheless, The Rocket fired up in the following frame - His flawless total clearance of 141 replaced the 140 from Trump made early in the match to become highest break of the tournament so far. Ronnie made 54 in the next frame, looked like he was going to pull another back. Unfortunately Trump ended Ronnie's comeback with a 65 to win 6-2. Trump: "I just want to go my own way and do things a little bit different to people in the past, I want my own identity. 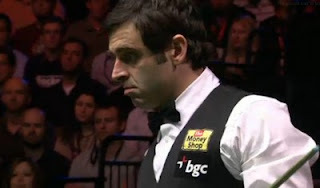 I don't want to be seen as the next Ronnie O'Sullivan, I want to be seen as Judd Trump, not the person who copied Ronnie O'Sullivan.'' O'Sullivan said: "Judd played a fantastic match, he scored heavily, potted some fantastic balls under pressure and made some good clearances. He performed better than me on the day and deserves his victory. John Higgins won the all Scottish match against Graeme Dott by 6-3. Higgins made 60 in the opening frame but Dott stole the frame with a 46. He would go 2-0 up but losing position on 47, Higgins cleared up to go 1-1 this time. Here comes the controversial third frame. The referee Jan Verhaas thought that he had miscalculated marks earned by Dott - Higgins left Dott a chance to score after a good safety. Dott was on a break but Jan gave Dott a sign for clarification of marks. 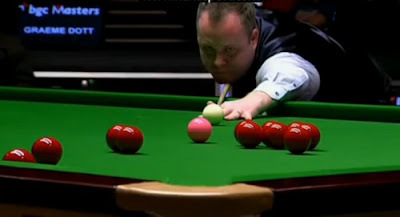 Eventually, Dott missed the pot after resuscitation of the break and Higgins took the frame. Jan apologized for his mistake post-match on Twitter. Dott and Higgins went 2-2 at the mid interval. The Wizard of Wishaw cruised to lead Dott over 5-2 with runs of 109, 75 and 64 before The Pocket Dynamo won the scrappy eighth frame on yellow to clear to pink. Higgins ended the match with a beautiful 89 to win 6-3.